I know what you're thinking: "this is not a typical photo of Paris!" No it is not, and though, what you're looking at is extremely popular in Paris - and in France in general. Yes, ladies and gentlemen, the news came at the beginning of October (see this New York Times article): the country that is known for its "haute cuisine", the country where women - supposedly! - don't get fat, the country where people love to think they are different... is the most profitable one after the US for Ronald! I think that the reason for this success is that even though it's a global company, they have adapted pretty well to local tastes. Hence this whole wheat bread Big Mac that we have in France (whole wheat is supposed to be healthier). What a cool photo! Looks kinda like a Pac Man (Pac Mac?). I won't start the McDo debate (I'm an In 'n' Out burger fan myself) but it's very interested to hear that McDonald's is that popular in France. You made it look so ethereal, as if it is drifting along silently on a magic carpet in the night sky. It could very well be part of a Andy Warhol style exhibit! It is a powerful symbol as much as coca-cola. As I told the US agriculture agent yesterday (who was rifling through all our crew luggage after we came back from Milan) that he would NOT find those sausages he was looking for or any other mystery meat in MY luggage. I am one of the few Americans that has not even eaten a McDonald's hamburger because I will not eat mystery meat. I did put my foot in a Parsian McDoo ONCE and had a cup of coffee while a friend ate. It came with a chocolate! And there were pastries in a cart to choose from! This story is 8 yrs. old so I have no idea if it is still like that. PS, the agent took my fresh cut pineapple, still in the container from a US Safeway, as it had "stepped foot" in Italy and was therefore contaminated!!!!! I hope that you did not consume what once occupied this MT box! Best we keep you healthy to continue producing these captivating images! Maybe the box is gobbling up what is left of French taste. Oh that was very bad! LOVE your photo, Eric! Le Big Mac itself, on the other hand . . .
Actually, PHX and Donna are not the only ones who have never had one of these culinary mystery-meat creations. Frankly, I'd rather eat steak tartare or boudin than a Big Mac! I knew many of the people I saw in McDonald's were French! They ate slowly, talked to their friends, and didn't finish everything. In Paris one can order a salad with a burger instead of fries. C'est la vie! Very a propos. I just watched "Food,inc". Oh that is funny, I never would have thought that to be! Great photo! Eric, another cool pic. It does appear to be on some wondrous mission. 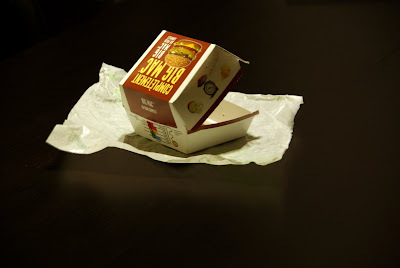 And may this big floating McWheat Wonder Mac container soon make its way to a recycling bin. I suppose with regard to fast food in Paris, I'm with Wren; I'd gladly trade a Big Mac for an honest croque monsieur or any other French sandwich for that matter. But I must confess, every now and then (every couple of years or so), I do get a hankering for a Big Mac; of course, after such instant gratification, I am left to wrestle with my gut's impersonation of Nadia Comaneci trying to stick the landing...and then I scold myself for taking on such a dangerous feat. only you could make a Big Mac container look like a fine art piece Eric! I hate to admit it but last summer we tried a "Big Mac" and an Iced coffee for a kick at McDonald's and it wasn't as bad as we thought it would be!! Okay..scream!! LOL!! But I thought the French liked "le quarter pounder Royale with cheese!!" LOL!! I worked at a McDonald's my senior year of high school. Two all beef patties special sauce lettuce cheese pickles onions on a sesame seed bun. Ah, the seventies. Good times. Vincent Vega: And you know what they call a... a... a Quarter Pounder with Cheese in Paris? Vincent Vega: No man, they got the metric system. They wouldn't know what the f**k a Quarter Pounder is. Vincent Vega: They call it a "Royale" with cheese. Jules: A "Royale" with cheese! What do they call a Big Mac? Vincent Vega: A Big Mac's a Big Mac, but they call it "le Big-Mac". Jules: "Le Big-Mac"! Ha ha ha ha! What do they call a Whopper? Vincent Vega: I dunno, I didn't go into Burger King. Talking about localization... Check this. They opened up about 100 meters from my house several years ago. These cartons are a familiar sight in the street, the park, my garden so I am finding if difficult to like this photo. Do French customers of this establishment leave their rubbish in the street as well or is dropping litter an English thing? Funnily enough I was talking with a friend about this very subject and we neither of us could work out why France is the second most profitable country for Macs. Personally I loathe them! Maybe it's that young people love most things American? I don't know. Eric, I am with Lily Hydrangea here... you are the best! Anonymous, reveal yourself at once. You are too funny. Maybe you are Michael playing games. What do you think Lynn? lol yes I think it's Michael too, Rosie and I remember that funny scene from Pulp Fiction well! Eric this is a good product photo, I like it. It amuses me that the French are most concerned about the content of the BREAD! Surely the meat inside is the most suspect thing and least healthy? I do admit to occasionally eating them and this sight and talking about them, makes me want one NOW! I wrote an article about French students living in California about three months ago. I asked each what he or she liked best about California, and the only one from Paris, a girl, said, "The food and the shopping." Since we see Paris as THE world capital for food and shopping, I asked her to explain, and she said she loves fast food "and all we have in France is McDo and Quick," and she loves shopping malls (she was a big fan of Abercrombie and Fitch, American Eagle and Hollister brands). When I told her I wanted to move to France, she couldn't figure out why I would ever want to leave California. Hahaha! Eric! Love the french version. Bon qui qui: are you sure you just don't want a coke? Bon qui qui: I got to get the ice cream out put some cookies all up in it I don't even know how to use that blender they got me pushin all these crazy buttons No you can have a coke. Let me get a nuber 6 with a large Coke Next! Bon qui qui: uh excuse me sir do you see me tryin to put in my order? Don't interrupt Rude and no lettuce that's it what? Bon qui qui: Oh so now you want some cheese? Bon qui qui: so now you want some cheese? if you see me puttin in your order why you ain't say nothin in the first place? Mr. Williams: Bon qui qui! Bon qui qui: oh hey Mr. Williams how you doin today? Bon qui qui: Oh is that what you had said? Bon qui qui: oh okay you right Mr. Williams oh yeah I'm sorry. Next Please! Customer #3: hi can I get a #5 with a boneless skinless chicken that's slightly seasoned? Mr.Williams: Bon qui qui What? Bon qui qui: Aw shoot Hey Dawade! Bon qui qui: Ok what cha wanna order boo? Bon qui qui: okay that's all you want? Bon qui qui: ooooh Let me put in your order on the mic is a queen so listen to me sing he wants a number 3 super size onion ring he can come out the house with no ankle bracelet on but he's got 2 strikes so don't get his order wrong Ya you know I'm looking cute and there's nothing you can say but If you get with me we can do it your way hey! Not Michael. But I do love to play games. I did a post on my Paris blog last summer when I caved and hauled the grandchildren down the street in a driving rain to McDonalds. I SWORE I would never darken the door of one in Paris, but off we went. THey got Happy Meals (which came with a book and not some junk toy). I had some fancy grilled chicken sandwich. They declared the Happy Meal, "Just like at home". The pricey chicken sandwich was awful. For what I paid for three of us we could have gone to a nice cafe. C'est la vie! And I'll also venture my opinion that American Coke is better than French Coke. Wine......that's another story! And I'll also venture my opinion that American Coke is better than French Coke. No, the Coke has gotten better here. I drank some in '06 and swore that I'd never drink a fountain soda in Europe again. But when I got here in September, I finally broke down and gave them another chance...and they're just fine. Even the Pepsi in Carrefour is labeled "nouveau gout" and tastes more like the American version. And don't you think it's just because France is the 1st country for tourism in the world ? That would mean that all these big macs are eaten mainly by tourists ? Absolutely LOVE what you did with this packaging Eric. It's floating! Here in India I'm ashamed to say that I've been to a Pizza Hut AND a McDonald's so far. I was brought by my Indian colleague when we were rushed for time. Of course they were both vegetarian and delicious I have to admit. Eric, nothing against your photo, but the French have to be smarter than to accept McDos. I have eaten at a McDonalds in France, at my friends insistance. It was not good. The worst was the ketchup, it must be one of the things that is adjusted. But the ketchup is the one constant in American hamburgers, its almost always Heinz brand, and it is probably the healthiest thing in the meal. I guess I haven't been to the big M for awhile now!